More than 650 miles of barriers already exist along the border. These walls, fences and barriers cut through sensitive ecosystems, disrupt animal migration patterns, cause catastrophic flooding, and divide communities and tribal nations. Now Donald Trump wants a wall across the entire 2,000-mile border. Trump’s wall would harm border communities, perpetuate human suffering, destroy thousands of acres of habitat and halt the cross-border migration of dozens of animal species. 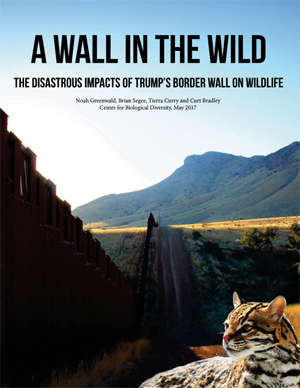 In fact, as revealed in the Center’s 2017 report A Wall in the Wild, 93 threatened, endangered and candidate species would potentially be affected by construction of a wall and related infrastructure spanning the entirety of the border. This is a looming tragedy for the region’s diverse wildlife and people, as well as its rugged and spectacular landscapes. We're fighting in the courts, in Congress and in our communities to stop Trump's cynical attack on our beautiful borderlands. Take our pledge to fight Trump's border wall today. With headquarters near the border in Tucson, Arizona, the Center has worked to preserve and protect the remote beauty and amazing biodiversity of our borderlands for decades. We've been fighting against border militarization — including the border wall — since the late 1990s, using litigation to block unlawful border policy, grassroots lobbying to stop legislation that would exacerbate environmental damage, and creative-media and public-education campaigns to get out the truth about the real impacts of the hugely expensive, largely ineffective and environmentally devastating border wall. We currently have three lawsuits in play on the border wall. In April 2017 the Center partnered with U.S. Rep. Raúl Grijalva in filing suit seeking a thorough analysis of the environmental impacts of border-security policy, including the border wall, under the National Environmental Policy Act. Another suit challenges the Trump administration's waiver of more than three dozen environmental, public-health and tribal-sovereignty laws in order to rush border-wall construction. And a third suit seeks to force the administration to release documents regarding its border plans, thus far withheld from the public. In May 2017 the Center partnered with the Tohono O'odham tribe in Mexico to file an endangerment petition for El Pinacate and Gran Desierto Biosphere Reserve in Mexico, just south of the border in the state of Sonora. A wall in that area would block cross-border migration of endangered Sonoran pronghorn and restrict access for the Tohono O'odham people, who travel across the border regularly for traditional and ceremonial purposes. In July 2017 the House of Representatives approved the Trump administration's $1.6 billion budget request to expand the U.S.-Mexico border wall, ignoring threats to protected wildlife refuges and border communities. Since then, the administration has been slowly moving forward with its plans — and waiving dozens of laws along the way. The Center has helped launch a campaign to pass resolutions in states, cities and counties across the United States opposing the border wall, with 38 passed so far. Many of these resolutions contain provisions for jurisdictions to divest from companies that agree to design or build the wall. Numerous local governments have enacted No Border Wall Resolutions. If you're an elected official or representative of a community or organization who'd like to get involved in our campaign to pass No Border Wall resolutions across the country, please contact Laiken Jordahl. Joining the United States and Mexico, our borderlands to the south comprise one of the biggest ecosystem complexes in North America, with some of the least populated areas and the most important wildlife habitats remaining on the continent. This border region is host to a diverse array of threatened, endangered and rare species — including the Sonoran pronghorn, lesser long-nosed bat, Quino checkerspot butterfly, cactus ferruginous pygmy owl, and larger predators like jaguars, Mexican gray wolves and ocelots — and it contains millions of acres of public lands, such as Cabeza Prieta National Wildlife Refuge, Organ Pipe Cactus National Monument, Big Bend National Park, Coronado National Forest and Buenos Aires National Wildlife Refuge. In the mid-1990s the U.S. federal government launched a strategy of militarization in the U.S.-Mexico borderlands that continues to this day. First the areas around ports of entry in El Paso, San Diego, and other urban areas along the border were hardened and walls were erected using solid steel panels from Vietnam War–era landing mats. This had the predictable effect of forcing undocumented migrants out into more remote areas to cross the border, where many died in harsh conditions. More than 7,000 people have died crossing the border in the past 20 years. Documents show that migrant deaths were a foreseen consequence of a conscious strategy to increase the difficulty and dangers of crossing the border as a deterrent to migrants. The strategy of pushing migrant traffic into wild areas did not work to stem the flow of undocumented immigration — but it did vastly increase the amount of environmental damage it was causing, as both the flow of migrants and the resulting border-law-enforcement activities were pushed into formerly untrammeled sites. Thousands of Border Patrol agents began driving off-road in remote areas, creating thousands of miles of new roads in designated wilderness and critical habitats for endangered species. As detailed in the Center's A Wall in the Wild report, more than 2 million acres of designated critical habitat exists within 50 miles of the border and is in danger of being degraded and destroyed by the construction of a wall and related enforcement activities along the border. In 2005 the U.S. Congress passed a clause in the REAL ID Act, which granted the secretary of Homeland Security the authority to waive any and all laws with regard to constructing walls and roads along the border. More than three dozen environmental, public-health and tribal-sovereignty laws have since been waived using this authority, resulting in hundreds of miles of additional border barriers and roads being constructed with little or no environmental review. The Trump administration has already used this authority three times to rush border-wall construction, most recently in January 2018 in New Mexico. The results of these waivers have been predictable. Without the thorough analysis of environmental impacts normally required by law, new border infrastructure has been constructed in ill-advised locations with poor engineering — resulting in massive flooding, erosion, and millions of dollars of damage to private property and public lands alike. STORY MAP: Check out Embattled Borderlands, a story-map project combining stunning photography with cutting-edge mapping and research to tell the story of the border wall and its harm. SPREAD THE WORD: Make sure your anti-wall posts on Facebook, Twitter and Instagram include the hashtag #NoBorderWall.